Be sure to add me to your favorites list. The Life and Public Services of Abraham Lincoln. New York: Derby and Miller, 1865. Large octavo, beautifully rebound (and re-sewn) by Courtney Sheehan in blue library buckram and former library book with the usual markings, 808 pages, indexed, plus ads. Steel engraved frontispiece portrait of Lincoln by A. Ritchie, and fifteen other full-page plates throughout. Water-staining in the front section, but otherwise a very good copy of the First Edition. [Attributes: First Edition; Hard Cover]. Check out my blog and my store! 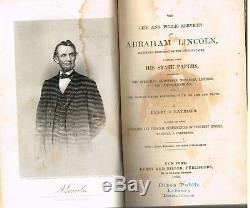 The item "The Life and Public Services of Abraham Lincoln 1865 1st Ed. Rare Antique Book $" is in sale since Wednesday, April 18, 2018. This item is in the category "Books\Antiquarian & Collectible". The seller is "llldk2" and is located in Dixon, Illinois. This item can be shipped worldwide.